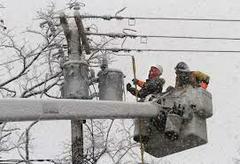 Morristown, N.J. – Jersey Central Power & Light (JCP&L) has implemented its storm restoration plan in anticipation of a winter storm that is expected to impact the area beginning on Thursday. JCP&L meteorologists monitoring the developing weather conditions have determined that portions of JCP&L’s service area in northern New Jersey could receive heavy snow. Areas in central New Jersey may receive less accumulating snow and occasional wind gusts up to 40 miles per hour. Customers who are without power are encouraged to call 1-888-LIGHTSS (1-888-544-4877) to report their power outage or click the “Report Outage” link on www.jcp-l.com. In the event of severe weather, customers should immediately report downed wires to JCP&L or their local police or fire department. Customers should never go near a downed power line, even if they think it is no longer carrying electricity. FirstEnergy customers can also utilize a new free smartphone app to report outages and access important information and services related to their electric accounts. The app is available for Apple® iPhone® and Android™ smartphones. Customers can use the keyword “FirstEnergy” to locate the apps in the online store. In addition, customers can use FirstEnergy’s text messaging service to report outages and receive updates on reported outages. Text REG to 544487 (LIGHTS) to get started. For updated information on JCP&L’s current outages, the storm restoration process and tips for staying safe, visit the 24/7 Power Center at www.firstenergycorp.com/outages.